In Eureka Springs, Arkansas in 1941, Joel, a 27-year-old husband and father, struggles to meet the needs of his family on the salary he earns as a printer. 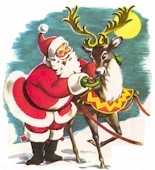 He is particularly distressed that he cant afford to give his 5-year-old daughter, Carol Lee, a small bicycle that she has seen in the Sears, Roebuck & Co. catalog and wants Santa Claus to bring her for Christmas. The bicycle sells for $23.95, a prohibitive sum for Joel whose $16 a week salary at the end of the Great Depression will barely cover basic necessities. Joel feels additional pressure from his wife, Julia. Forced by economic circumstances to make gifts for her more well-to-do sisters and brothers, Julia is embarrassed that her relatives can afford to give her family store-bought gifts while she cannot reciprocate in kind. This Christmas Julia is making hand-painted sprinkler bottles and bread boards for gifts and dreads opening presents from others. Adding to the pressure that Joel and Julia are feeling, the bombing of Pearl Harbor shocked the country on December 7, and war has been declared against Japan. They have tried to convince Carol Lee that she shouldnt expect a bicycle this year because "Santa needs all the metal he can get for the war effort." The precocious child, however, has not accepted this argument. After all, she has seen the bicycle in "Santas catalog" and has sent a letter to the North Pole with a bicycle as number one on her wish list. On Christmas Eve after putting Carol Lee and her 4-year-old sister, Babby, to bed full of dreams and excited anticipation about Santas impending visit, Joel decides that he must somehow manage to get the bicycle for Carol Lee. Over Julias protests, he hurries downtown as the stores are closing. The General Store doesnt have a junior-size bicycle but Firestone has exactly what Carol Lee wants. The bicycle is more expensive than the one in the Sears catalog, but Joel has made up his mind to buy it. He offers the clerk a down payment of all the cash in his wallet, $2.50, and promises to make weekly payments of $2.50 until the balance is paid off. The store, however, has a national policy not to sell on credit without an established charge account and a credit check takes two weeks. As Joel pleads with the manager to make an exception to the stores policy, another customer buys the bicycle. Joel leaves the store as the Christmas lights in the downtown section are going dark, devastated that he has been unable to buy the gift his daughter has anticipated for months. It seems a metaphor for how he is failing in his role as his family's breadwinner. Fighting back emotion, he walks home in the rain, passing a church where Christmas hymns and Lukes account of the Christ child can be heard. Angrily, he lifts a brick to smash a nativity display in front of the church but stops in mid-air when he hears a noise behind him. Thinking hes been caught on the verge of committing a destructive act, he turns to find that only a dog in the road made the noise. The interruption is enough for Joel to change his mind about smashing the nativity scene. Instead, he explodes his anger and frustration by chasing off the dog. On Christmas morning, Joel and Julia exude forced excitement in an attempt to "sell" Carol Lee on her toys that mostly have been made by Joel. But there is no bicycle and the quiet child is obviously disappointed. Then when Joel goes into another room, he is puzzled to hear great excitement from Carol Lee in the living room!!! You must see the film to learn the ending!